It’s larger, but only in one direction: taller. You don’t realise how much difference that makes unless you actually start using it: it’s only been a few days, and already my iPhone 4 feels cramped by comparison. The bezels on all four sides is slightly thinner, and because of that, the display looks larger than it actually is. There’s some kind of crazy Apple reality-distortion-field business going on here, and I like it. I like it a lot. I used to think the iPhone 4 was a perfect fit in the hand, but now, now I think the 5 is. Apple has also changed the auto-brightness algorithms. When you wake the display, it’s not immediately eye-searingly bright and then adjusted for the current ambient-light level after you unlock it like the 4 is: instead, the lockscreen is now just as bright as the adjusted brightness level is. Changing the brightness of the display is also done much more smoothly — but this has resulted in quite dynamic changes over time, such as the time I was on the bus and the sun was constantly going behind clouds. The iPhone’s display would go bright, then dark, then bright again. More testing is needed in this area to see whether this was a one-off, but for the most part, the automatic brightness is now a lot more Mac-like; gradual brightness changes. The display is also much more warmer than the 4/4S display. Not something you’ll notice unless you have them side by side, but it’s definitely noticeable when you do. Colours look amazing on the iPhone 5 display, and the green bubbles in Messages are especially vibrant without being over-saturated. Everything looks better with the iPhone 5 display. App icons, apps themselves. I had a lot of good things to say about the design of the iPhone 4, the now iconic aluminium-band sandwiched between two panes of glass. 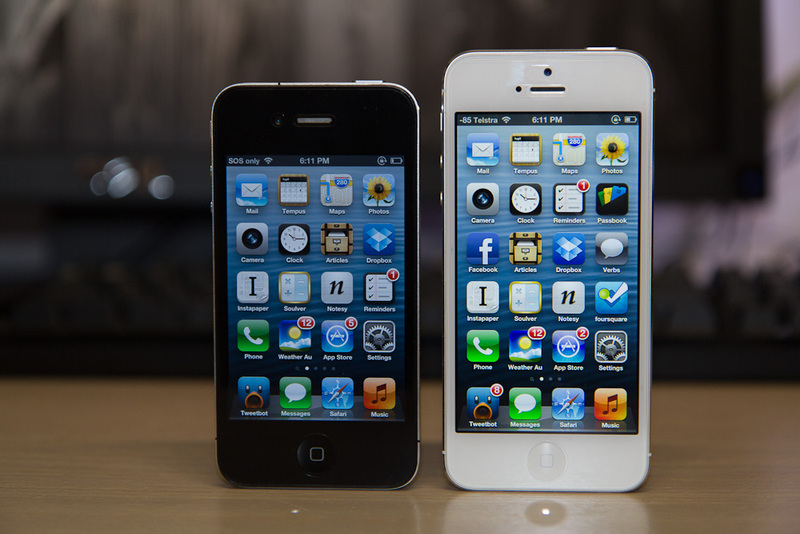 But the iPhone 5 is both thinner and lighter than its predecessor. As it turns out, aluminium is is both thinner and lighter than glass, even if it is a lot less scratch-resistant. 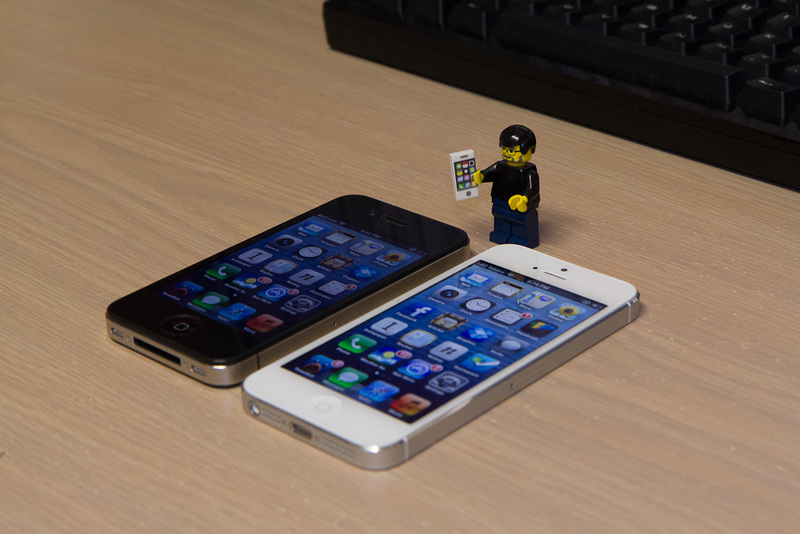 I’m not saying the iPhone 4 is a brick or anything, but comparing the two, it’s easy to notice that the weight of the 5 is now more comfortable than the 4 was. All my previous iPhones have been black; for the iPhone 5, I decided to go with white simply because it looks really, really nice. White may be for girls, but it looks amazing. I just hope I’ll be able to keep it clean — any dust you have on the front is super-noticeable due to the way everything casts a shadow on the white background. A scree protector on my black iPhone was invisible, but it’s a little less so on the white iPhone. Interestingly, the home button has more travel than it did in the 4. I’m pretty sure the home button of my iPhone 4 isn’t busted, but that thing barely indents inwards, moving perhaps a millimetre when pressed. The iPhone 5 home button feels more solid; there’s a more noticeable click when pressing it, and it also depresses about one and a half times the depth of the iPhone 4. When iOS 4 came out for the iPhone 3G, it was a piece of crap. Things slowed to a crawl. I’ve since upgraded my iPhone 4 to iOS 6, and besides that whole maps thing, I haven’t noticed slowdowns at all. Maybe in a few games here and there, but that’s to be expected. With the iPhone 5, there’s none of that. It’s crazy fast. Apps load information as fast as your Wi-Fi or LTE allows, and there’s no waiting for apps to load. Some games still show loading screens here and there, but like I said above — that’s par for the course, really. 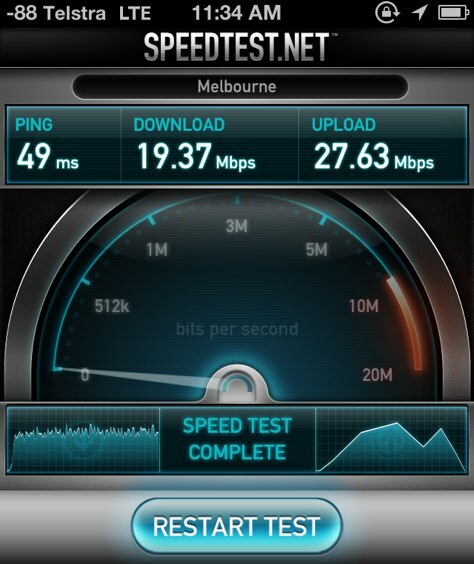 Speaking of LTE, here’s a speed test from Telstra in Hobart with an average network connection. For the record, the download speed on LTE is almost three times as fast as the ADSL2+ link I have at home, and that upload speed blows my broadband uploads out of the water. There’s heaps of other details that are great about the iPhone 5, and even a few that aren’t so great. But this “review” is long enough already. 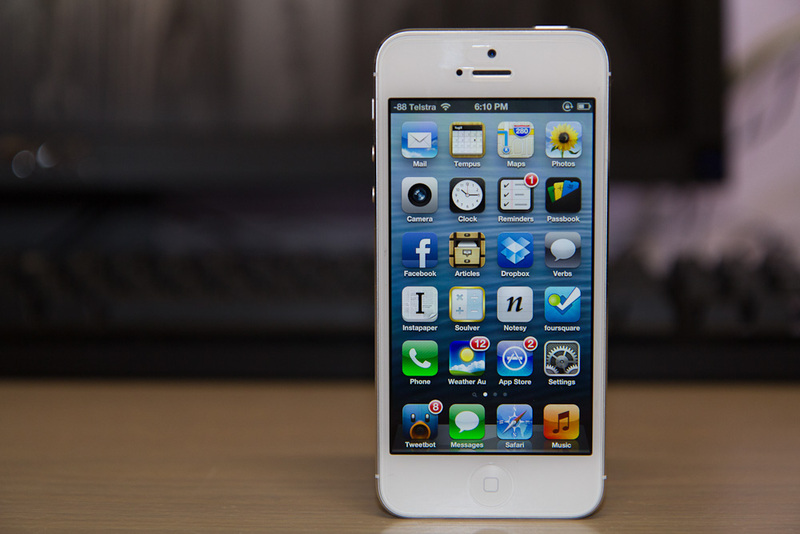 In summary: the iPhone 5 is the thinnest, fastest, lightest iPhone to date. Forget people that say “it’s exactly the same” as the old iPhone, because it’s not. It may run the same apps, and it may look more or less the same, but as always, it’s about the little details. The switch from a glass to an aluminium back. The chamfer on the edges, polished to a mirror-like finish. The new home button action. Apple avoids the temptation of jetpack design, and that means better products, year-on-year. You may perceive this iterative product cycle as boring, but this is what Apple do, and no-one in the world is better than them at it. Until such time, there’s the iPhone 5.